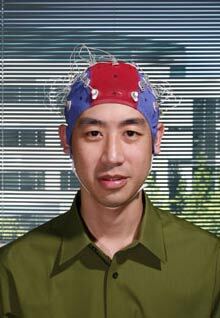 It's not unusual to walk into Desney Tan's Microsoft Research office and find him wearing a red and blue electroencephalography (EEG) cap, white wires cascading past his shoulders. Tan spends his days looking at a monitor, inspecting and modifying the mess of squiggles that approximate his brain's electrical activity. He is using algorithms to sort through and make sense of EEG data in hopes of turning electrodes into meaningful input devices for computers, as common as the mouse and keyboard. The payoff, he says, will be technology that improves productivity in the workplace, enhances video-game play, and simplifies interactions with computers. Ultimately, Tan hopes to develop a mass-market EEG system consisting of a small number of electrodes that, affixed to a person's head, communicate wirelessly with software on a PC. The software could keep e-mail at bay if the user is concentrating, or select background music to suit different moods. As early as 1929, researchers observed slight changes in EEG output that corresponded to mental exertion. But these results haven't led to a mass-­market computer-input device, for a number of reasons. Most EEG experiments are conducted in labs where electrical "noise" has been minimized, but outside the lab, EEG is susceptible to electrical interference. EEG equipment also tends to be expensive. And previous research has averaged data from many users over long periods of time; some studies have shown that individual results vary widely. Tan's EEG cap has 32 electrodes that are affixed to the scalp with a conductive gel or paste. When neurons fire, they produce an electrical signal of a few millivolts. Electronics within the device record the voltage at each electrode, relative to the others, and send that data to a computer. A subject using Tan's system spends 10 to 20 minutes performing a series of tasks that require either high or low concentration--such as remembering letters or images for various amounts of time. EEG readings taken during the activity are fed to a computer, which manipulates them mathematically to generate thousands of derivations called "features." The machine-­learning algorithm then sifts through the features, identifying patterns that reliably indicate the subject's concentration level when the data was collected. Tan and his collaborators at the University of Washington, Seattle, and Carnegie Mellon University have shown that a winnowed set of about 30 features can predict a subject's concentration level with 99 percent accuracy. Tan expects the technology to be used initially as a controller for video games, since gamers are accustomed to "strapping on new devices," he says. In fact, next year a company called Emotiv Systems, based in San Francisco, plans to offer an EEG product that controls certain aspects of video games. However, the company will not discuss the specifics of its technology, and there isn't widespread consensus on the feasibility and accuracy of the approach. The true challenge, Tan says, will be to make EEG interfaces simple enough for the masses. He and his team are working on minimizing the number of electrodes, finding a semisolid material as an alternative to the conductive gel, and developing wireless electrodes. A mass-market product could be many years away. But if Tan succeeds, getting a computer to read your thoughts could be as easy as putting on a Bluetooth headset. In the recent video message from MIT Tech Review editor Jason Pontin talks about the ownership of ideas. He uses the example of the Cameron and Tylor Winklevoss vs. Mark Zuckerberg case: the Winklevoss brothers claim that Zuckerberg stole their idea for a social networking website to create Facebook. Unlike the project of the Winklevoss brothers, Facebook is very succesfull and Zuckerberg made it into TR35. According to Jason Pontin, "the person who owns the idea is the person who brings the idea best to the marketplace". I agree and find it very interesting that Desney Tan made it into TR35. Research on Brain-Computer Interfaces (BCI) is not new, about 20 years old and a legion of computer scientists have hooked up EEG devices to computers to control cursors, type sentences or control games. So Desney Tan can surely not claim ownership of the idea based on novelty. But can he claim ownership of the idea based on how he brings BCI to the marketplace? Surely not, the device by emotiv is far more advanced and will hit the market next year, it's already accessible to developers. However, the article claims that emotiv "will not discuss the specifics of its technology, and there isn't widespread consensus on the feasibility and accuracy of the approach". Well, this also holds true for Tans research. He didn't publish his findings, it's not commercially available, so there can not be consensus about Desney Tan's approach, let alone widespread consensus. Regarding BCI technology, emotiv clearly has the most advanced and most available technolgy, so it is completely unlclear to me how Desney Tan gets listed as TR35. Any computer scientist can hook up an EEG found at a "New Age" store, run the output through a ANN or SVM and control a cursor or game that way; this has been done already in the past 20 years. But perfecting this technology and bringing it to the market, this is the hard part. emotiv succeded where Microsoft failed. Agree mostly, but there is a subtle difference if the implementation, or attempt in implementing the general idea has a significant "twist" making it radically different. ie it morphs the original idea into something similar yet better with key differences. In Desney's case, the key challenge is to get his filter algorithms to be good enough such that the intended task , this input method aims to achieve can be done seamlessly and easily. It is no easy feat, since the guy who invents a similar system to detect speech (without any sound) from the throad has achieved. The principle is almost identical, but detection and filtering methods are radically different. Still very distinctly different in intended purpose. In our human world, very very few new ideas are original these days, only a person who can invent a new physics and leverage that into some compelling new product would really be original. The rest are pretty much derivatives of old ideas using newer and novel implementation approaches.